African Studies affiliate faculty conduct diverse research on timely global issues, ranging from China-Africa relations to motion picture politics in Nigeria to Ebola and infectious disease response. Our Africana library collections is celebrated as one of the best in the world, including more than 270,000 monographs with titles in more than 86 languages. Africa Focus (http://digicoll.library.wisc.edu/AfricaFocus/) is the largest collection of Africa images and sound clips freely available on the web, with all of materials donated to the African Studies Program over the last 50 years, most by our faculty. 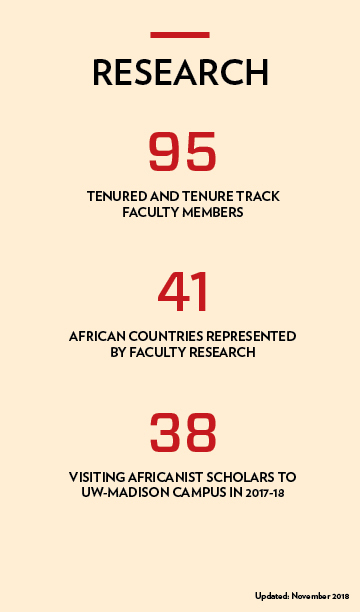 A quarter of all African Studies Association presidents have been Wisconsin faculty members or alumni. 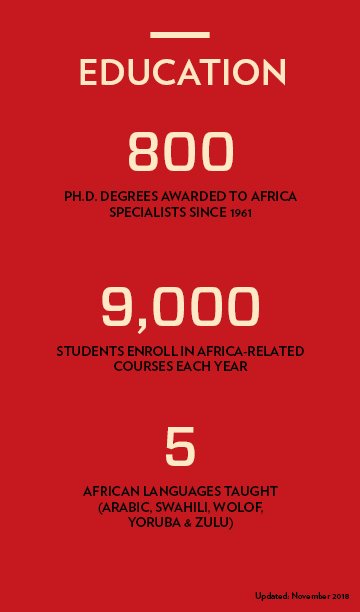 Each year, Wisconsin students have the opportunity to enroll in more than 197 Africa-related courses from 29 unique campus departments. More than 15,000 people, now in all walks of life, have taken the university’s basic Africa course, Africa: An Introductory Survey. It is offered every semester. Professor Harold Scheub’s course, The African Storyteller, has enrolled more students than any other humanities course in the history of the university. It is still going strong. In addition to five regularly offered African languages, students have the extremely unique opportunity for independent learning of other languages across the continent through a monitored Multilanguage Seminar offered each semester. Nearly half (48%) of undergraduate African Studies certificate students study abroad in Africa. Every Wednesday at noon – since 1973! – African Studies Program faculty members, students, and others have gathered for a one-hour seminar on Africa. The public is welcome. Each year, the African Studies Program hosts Day in Africa, a unique opportunity for high school students and teachers from across the state to learn about the continent. In 2018, 260 students and 35 teachers attended. In 2017-18, 16 African Studies Outreach Scholars visited 2,034 k-12 students and 151 teachers. Wisconsin is a three-year host of the Mandela Washington Fellowship for Young African Leaders, a exchange program of the U.S. Department of State. Over three years, the program has brought 75 young African leaders representing 33 countries to Madison where they engage with the campus and local community, contributing their ideas and more than 400 hours of community service each summer.